Varolz, the Scar-Striped ($0.42) Price History from major stores - Dragons Maze - MTGPrice.com Values for Ebay, Amazon and hobby stores! 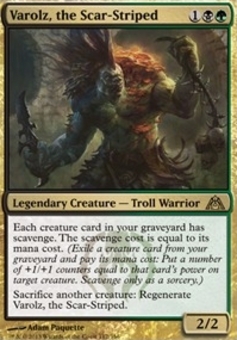 Card Text: Each creature card in your graveyard has scavenge. 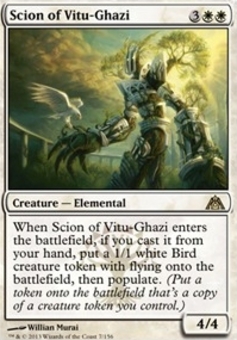 The scavenge cost is equal to its mana cost. 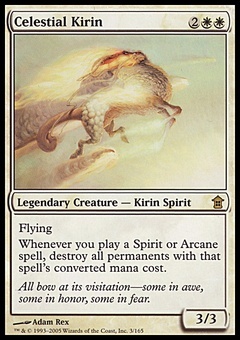 (Exile a creature card from your graveyard and pay its mana cost: Put a number of +1/+1 counters equal to that card's power on target creature. Scavenge only as a sorcery.) Sacrifice another creature: Regenerate Varolz, the Scar-Striped.